This composite image, created using data from the Chandra X-ray Observatory and the Spitzer Space Telescope, shows the molecular cloud Cepheus B, located in our galaxy about 2,400 light years from the Earth –a region containing cool interstellar gas and dust left over from the formation of the galaxy and mostly contains molecular hydrogen. The Spitzer data, in red, green and blue shows the molecular cloud (in the bottom part of the image) plus young stars in and around Cepheus B, and the Chandra data in violet shows the young stars in the field. These data provide an excellent opportunity to test a model for how stars form. The new study suggests that star formation in Cepheus B is mainly triggered by radiation from one bright, massive star (HD 217086) outside the molecular cloud. According to the particular model of triggered star formation that was tested — called the radiation- driven implosion (RDI) model — radiation from this massive star drives a compression wave into the cloud triggering star formation in the interior, while evaporating the cloud's outer layers. Different types of triggered star formation have been observed in other environments. For example, the formation of our solar system was thought to have been triggered by a supernova explosion, In the star-forming region W5, a "collect-and-collapse" mechanism is thought to apply, where shock fronts generated by massive stars sweep up material as they progress outwards. 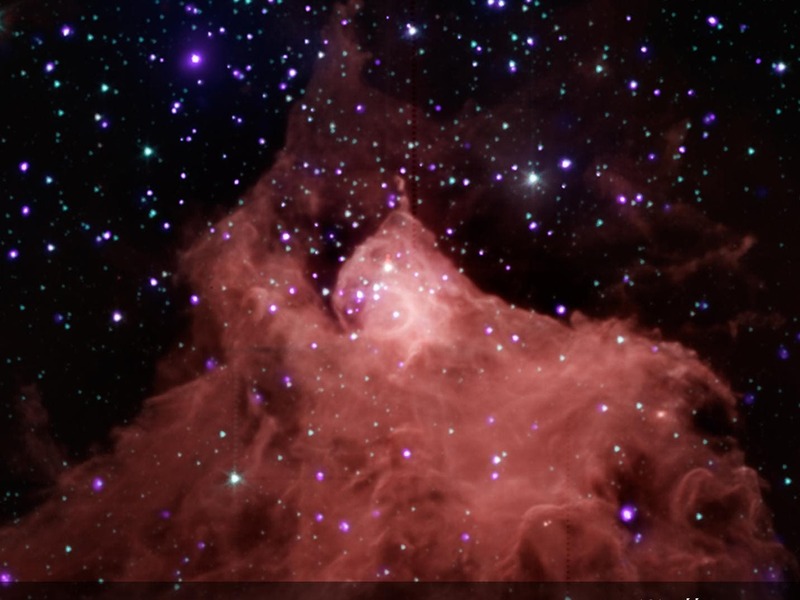 Eventually the accumulated gas becomes dense enough to collapse and form hundreds of stars. The RDI mechanism is also thought to be responsible for the formation of dozens of stars in W5. The main cause of star formation that does not involve triggering is where a cloud of gas cools, gravity gets the upper hand, and the cloud falls in on itself. Image Credit: X-ray: NASA/CXC/PSU/K. Getman et al. ; IRL NASA/JPL-Caltech/CfA/J. Wang et al.